The Nightshade Nanny Mouse can be found in the Labyrinth and Zokor. It is known to drop Cavern Fungus and Nightshade. These nannies nurse their bundle of spores until they are ready to be released. Quite dear and precious to her, she is armed with a crystalline spear capable of penetrating the strongest of metals with a parent's protective instincts to drive it. The Nightshade Nanny Mouse prefers Glowing Gruyere in both the Labyrinth and Zokor, but can be attracted with Standard Cheeses. Forgotten and Arcane weapons are very effective against the Nightshade Nanny Mouse. 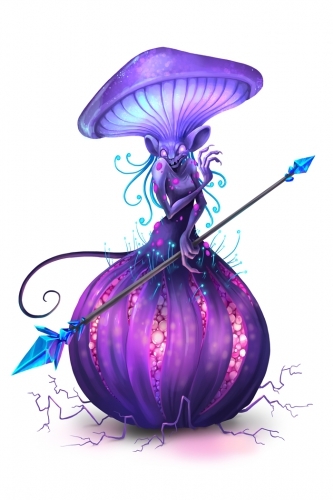 The Nightshade Nanny Mouse can be found in Superior Farming. The Nightshade Nanny Mouse can be found in the Farming Garden, and the Overgrown Farmhouse. Nightshade Farming Charm - Causes the Nightshade Nanny Mouse to drop an additional Nightshade. The Nightshade Nanny Mouse drops the Nightshade Egg during the annual Spring Egg Hunt. 9 September 2015: The Nightshade Nanny Mouse was introduced as part of the Hollow Heights release.